Zion Market Research has published a new report titled “Foot Orthotic Insoles Market by Material (Leather, Polypropylene, and Others) for Sports, Medical and Other End Users: North America Industry Perspective, Comprehensive Analysis, and Forecast, 2014 - 2022”. 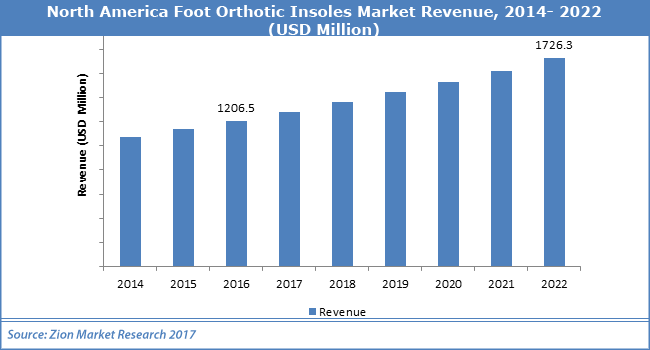 According to the report, foot orthotic insoles market in North America was valued at approximately USD 1,206.5 million in 2016 and is expected to generate revenue of around USD 1,726.3 million by end of 2022, growing at a CAGR of around 6.2% between 2017 and 2022. Orthotics is concerned with the design, manufacture, and application of orthoses. Orthoses are devices used to modify the structural and functional characteristics of the neuromuscular and skeletal system and are applied externally. Orthotic insoles are molded shoe inserts made up of leather, rubber, plastic or other synthetic material. They balance the foot in neutral position and also provide cushioning to foot. There are many types of foot orthotic insoles available in the market namely, prefabricated, cushioning orthoses, pressure relief orthoses and custom foot insoles. North America foot orthotic insoles market is primarily driven by growing incidences of diabetes and increasing demand from sports applications. Other major driving factors are increasing aging population and increasing awareness about benefits of using foot orthoses. However, the high price of the orthotic insoles is the major restraint that may limit the growth of the market. Nonetheless, technological advancements in foot orthotic insoles research are likely to disclose the new avenues for foot orthotic insoles market in the near future. The foot orthotic insoles market is segmented on the basis of material and end user. Based on material, foot orthotic insoles market has been segmented into leather, polypropylene, and others (polyethylene foams, cork, acrylic, composite carbon fibers, etc.). Polypropylene segment is expected to grow at the fastest rate during the forecast period. Different end users in foot orthotic insoles market are sports, medical and others. In terms of revenue, medical end user segment dominated the market in 2016. The foot orthotic insoles market is set to grow at a substantial pace over the next few the years. North America has become a matured market as compared to rest of the world in terms of demand for foot orthotic insoles. In addition, this region has an established customer base owing to the rising awareness towards healthcare and technological advancements and is currently dominated by U.S. Some of the key players in foot orthotic insoles market include Bauerfeind AG, Hanger Orthopedic Group, Bayer AG, Spenco Medical Corporation, Aetrex Worldwide, Inc, Comfortfit Orthotic Labs Inc, Sole and OttoBock Holding GmbH & Co. KG among others.